You'll need Aviana to set minion cost to 1 + Kun the Forgotten King (or a 1 left of durability) Twig of the World Tree to refresh your mana crystals + Brann Bronzebeard to double the curses of ancient shade ----- now, when you're near fatigue , might as well draw the rest of your cards, to hit fatigue, with cards like Branching Paths and Nourish. So, if you hit fatigue, you need to set this up. 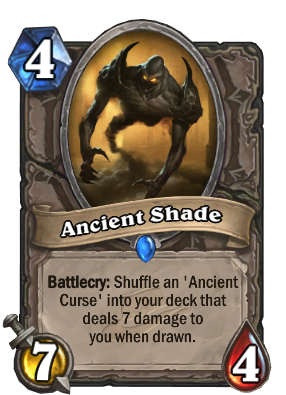 Then, set the combo, and you should now use 2 Ancient Shade's with brann, you'll have now 28 damage of Ancient Curse's , so, if you want to add Youthful Brewmaster or Ancient Brewmaster to your deck, you can drop ancient shades again on the board, this might be good, because this can guaranteee more than 4 curses (at least 42 damage, if you have 6 curses now, for example) it's ok, since your objective is to stall your opponent until you hit fatigue, so, your opponent can still have a lot of health, since we're playing on defensive mode in this deck. then, pass your turn and watch the cursed enemy fall, without knowing what hit him, LOL ! It's probably not optimal, but I like this in a pirate warrior deck as one of the more expensive minions. Most of the pirate synergies are best with lower cost pirates anyway, so it's not hard to justify swapping out a more expensive pirate. While it's possible you'll play him right into a perfect kill spell curve for the opponent, they're less likely to have removal for him after dealing with Pirates, and they probably don't have minions ready to hit him on turn four due to you either clearing them or them trading with pirates. If you get to a point where drawing his curse would really hurt you, you probably lost anyway. And the curse could even be a boon if it helped you reach mortal strike territory against a control deck. 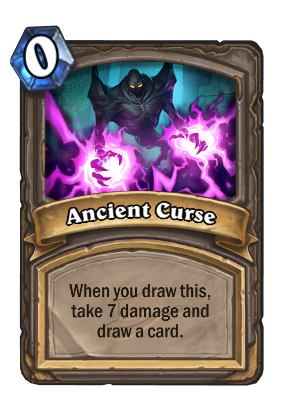 Something that might be worth mentioning is that the Ancient Curse card actually counts as being discarded when it dissapears, activating the effects of Malchezaar's Imp and Tiny Knight of Evil. I've been playing one copy in an only half-serious zoo warlock deck that utilizes a lot of discard mechanics and a lot of very reckless strategies. If you have board control and drop it on turn 3-4 it can be overbearing. I think its been underestimated in aggressive decks because you will likely win or lose before you draw into it. I can imagine that an aggrisive deck with this card and Fel Reaver + a lot of 1, 2 and 3-drops (and maybe some other big stuff) would be pretty good. He is the best against face hunter. You will likely die before drawing the curse. This guy and Fel Reaver fit like a glove. Aggro Druids may love this. And it makes Piloted Sky Golem damn good. But is it good enough? if you get this out by turn 4 with a board presence.... in a deck like secret paladin where your opponent is focusing on killing your minions and not your health... this card is actually really good. i have a different opionion..
You literally tell opponnent... kill this card or die in 3 turns.... i would love a fireball on this instead of my face.... for a 1/30 chance to take the same dmg to the face. Played with an aggro deck this card is actually pretty good.... it requires your opponent to do something to it next turn instead of a good minion like Dr 6 or Dr 7 or shredder.